Does Brown or White Rice Contain More Fiber? Figuring out what to eat when you have diabetes can often be a confusing task. Making important food choices that will impact your health and your blood sugar control is not always straightforward either. That's why sorting out the facts and figuring out what your best food options are is extremely important. One of the questions that often comes up in the diabetes community is: Should you eat white rice or brown rice? There is a clear answer. "Americans eat about 26 pounds of rice per person each year. Asians eat as much as 300 pounds per person each year, while in the United Arab Emirates it is about 450 pounds, and in France about 10 pounds." One of the reasons rice is so popular is because it adapts to any flavor and seasoning, and adds substance and texture to meals. And, although it is carbohydrate dense, it does have health benefits that can make including rice in your diet a heart-healthy option. 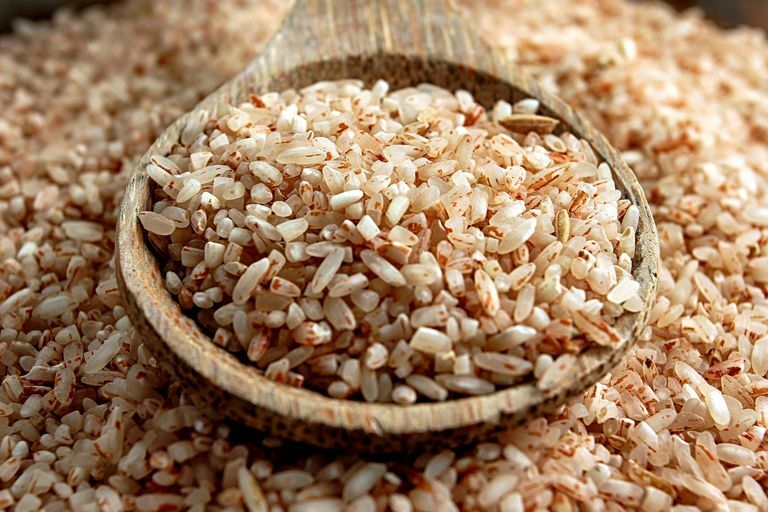 Instead of omitting rice altogether, many people choose to eat brown rice over white rice for its health benefits and it's slower glucose-raising effect. In fact, one study conducted by scientists at the Harvard School of Public Health suggests that replacing white rice with brown rice could lower diabetes risk by an estimated 16 percent. Brown rice is a whole grain, meaning that 100 percent of the grain is intact, leaving it with more vitamins, minerals, and fiber than white. White rice is pearled—a process in which the grain passes between a machine where it is rolled and the bran is gently "pearled" off, leaving the white kernel intact. Pearling takes place to reduce cooking time, extend shelf life, and soften texture, however, once complete the rice is no longer a whole grain and is instead considered a processed, refined grain. Brown rice contains thiamin, a b-vitamin that helps with carbohydrate metabolism. It also contains magnesium and selenium. Magnesium is the structural component of bones that assists in hundreds of enzyme reactions involved in the synthesis of DNA and proteins and is required for proper nerve conduction and muscle contraction. Selenium influences thyroid function and is important in antioxidant enzymes. Brown rice contains about seven times more fiber than white rice per serving. This is especially important for people with diabetes because fiber is essential in satiety and stabilizing blood sugars. Fiber aids in heart health too, as it can help to reduce bad cholesterol. One cup of cooked medium grain white rice contains 0.5 grams of fiber, whereas 1 cup of cooked brown rice contains 3.5 grams of fiber. Brown rice also contains fewer calories and carbohydrates than white rice (about 25 calories and 7 g carbohydrate). The glycemic index is a number that rates foods that contain carbohydrate on a scale of 1 to 100. Foods that are higher on the scale, closer to 100, are high-glycemic index foods, while foods on the lower end, closer to 1 are low-glycemic index foods. The idea behind the glycemic index is that higher glycemic index foods will raise blood sugars more quickly than lower glycemic index foods. Brown rice averages around 50 on the glycemic index chart, while white rice ranks about 63-72. Therefore, white rice would raise blood sugar more quickly than brown rice. Although brown rice is lower on the glycemic index, it does not make it a low glycemic index food. Portions of brown rice should be controlled and measured depending on a person's meal plan and the amount of carbohydrates that should be eaten at each meal. Generally speaking, 1/3 cup of cooked rice contains about 15 g of carbohydrate. If you are eating brown rice as your main carbohydrate at your meal, you should consider limiting your portion to about one fist full or a cup's worth (which equals about 45 g of carbohydrate). When in doubt about how a food will affect your blood sugar, check it before and after. Ideally, two hours after the start of your meal your blood sugar should be less than 180mg/dL. If it is higher, then perhaps you ate too much rice or rice is not a good carbohydrate choice for you. Everyone reacts to different types of carbohydrates in different ways. In addition, the meal composition can play a role. For example, if you eat brown rice and beans only or brown rice, fish, and vegetables, you'll likely see a different blood sugar reading post meal. Rice is a gluten-free grain that can be enjoyed by people who follow a gluten free diet. In addition to brown rice, wild rice is a whole grain that is rich in vitamins, minerals, and fiber. Varieties of rice are divided into categories based on the seed size—long grain, medium grain, or short grain. For example, brown Basmati rice is a long grain rice, while sticky rice and arborio rice, otherwise known as risotto, are types of short grain rice. The length of the grain may affect the starch content of the rice. Shorter grain rice can be starchier than long grain. For example, 3/4 of cooked brown Basmati rice contains about 33 g of carbohydrate, whereas, one cup of cooked short grain brown rice contains 35 g of carbohydrate. This may not seem significant, but if you are following a strict carbohydrate controlled meal plan, you'll want to know the difference. When in doubt, always read labels. Some people with diabetes claim that parboiled rice has a reduced impact on their blood sugars. Although parboiled or converted rice is not a whole grain, it does have a lower glycemic index than regular white rice. During the processing, some of the vitamins and minerals are absorbed into the grain, but it is still inferior to brown rice nutritionally. If you love rice and seem to have a hard time controlling your blood sugar when you eat it, then you can always give parboiled rice a try. Enriched rice contains more vitamins and minerals than regular white rice. Sun Q, et al. White rice, brown rice, and risk of type 2 diabetes in US men and women. Archives of Internal Medicine. June 14, 2010; 170 (11): 96-9. Whole Grains Council. Rice and wild rice September grains of the month.